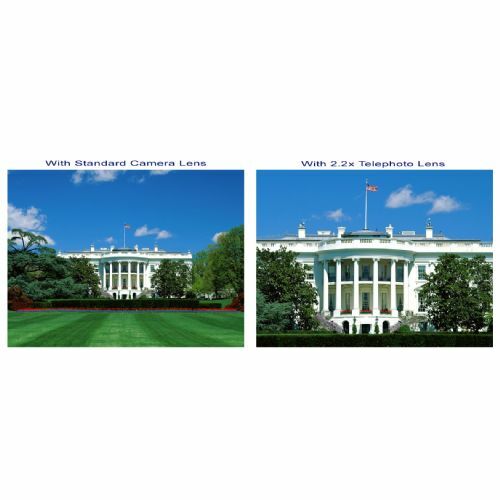 This Titanium Optics multi-coated 2.2x lens is a professional grade, telephoto converter that increases the angle of view by more than double, allowing the video or digital camera to take breathtaking long distance shots. This high-speed, fully automatic lens features multicoated optical glass, Day or Night Vision, Infrared Compatibility. Lens: Power: 2.2x times conversion factor of your current lens setting., Optical System: Conversion type; mounts on front of existing lens., Mounting System:Screw type in front of existing camera lens into the filter accessory threads., Optics: Designed to maximize use day and night with coated optics to provide maximum image transmission with minimum distortion., Auto Focus:Utilizes camera auto focus system., Adaptability: Maintains all the camera functions plus it provides 2.2X telephoto lens conversion power. 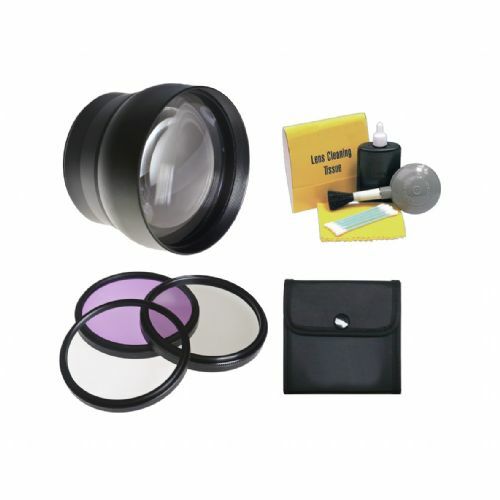 Accepts 72mm Filters., Includes lens cap, bottom cover, & pouch.Filters: UV filter (ultraviolet) for protection against dust, dirt, scratches, fingerprints and the sun's ultraviolet rays., Polarizing Filter. Used to increase color saturation, like darkening blue skies so that white clouds stand out., FL-D filter (fluorescent) for taking pictures indoors under fluorescent lights. This filter removes the greenish tint given off by fluorescent lighting., compact protective carrying case for transporting and storing your set of filters., compact protective carrying case for transporting and storing your set of filters.Cleaning Kit: Top quality lens cleaning fluid containing 30cc of formulated solution that will remove dirt and dust by eliminating static., Lens cleaning tissue for safe, effective cleaning of all lens and filter surfaces. Convenient tear away booklet contains 50 tissues., Medium size blower brush for removing loose dust from lens surface. Detachable brush head allows for stronger air jet., Five quality cotton swabs for cleaning hard-to-reach camera and accessory parts., Soft-tex silicone cloth for wiping camera lens and other exterior surfaces.